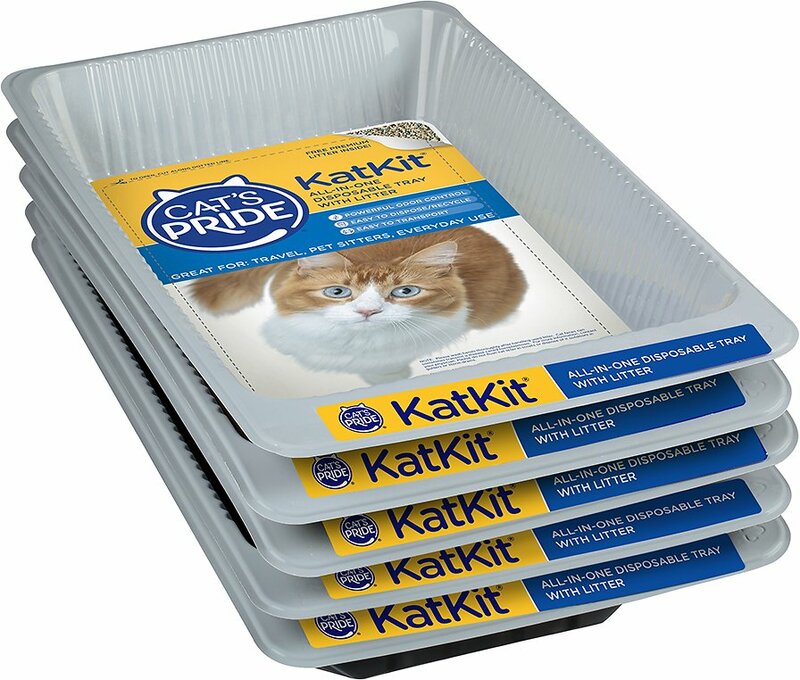 Make cat litter box cleanups hassle-free with the disposable pre-filled Cat's Pride Kat Kit Litter Trays. These fully disposable, touch-free plastic trays come in a case of five and are made from 100% recycled plastic, making it easy on the planet and they’re easy to use—just open, use and dispose. Each portable tray is pre-filled with three pounds of Cat’s Pride Fresh & Clean litter, which is a fresh-scented clay litter with natural sponge-like minerals great for absorbing and stopping odors before they start. It’s made with a low-dust and tracking formula to ensure your kitty stays happy and your home stays clean. An all-in-one disposable tray with superior odor-control, this litter is perfect for travel, sitters or simply for hassle-free cleanups. Cat’s Pride is proudly endorsed by the American Humane Society, so you can feel good about using them as a go-to cat litter trays. Five disposable cat litter trays pre-filled with Cat’s Pride Fresh & Clean litter—a superior odor-control litter with low-dust and tracking formula. Easy to use, hassle-free, portable and throw-away clay-based cat litter boxes that you simply open, use and dispose. All-in-one disposable tray with fresh-scented clay litter to ensure your kitty stays happy and your home stays clean. A non-clumping litter that’s perfect for traveling, to take to your kitty-sitters or for simple for hassle-free cleanups—it’s litter made easy. A product the American Humane Society stands by, so you’re getting a great value and will feel good about giving your kitty the best. Dispose of Kat Kit Litter Tray after use. I have used these disposable litter boxes for my cats for several years, and love that I can just dispose of them as needed and replace them with fresh ones. No hassle with cleaning and disinfecting a permanent box. I have trouble finding them in local stores, so being able to order them from Chewy is a blessing! These worked great when driving from Texas to California with three cats. One box went in the travel cage with the cats and others were used for hotel stops for the night and for the first night in the new apartment. It was very convenient to have litter already in the boxes and to be able to toss out the whole box when finished with one. I would definitely recommend these for traveling. This is a great idea for regular cats, but if you have a special needs cat that wobbles and falls over I don't recommend,my special needs who has cerebellar hypoplasia came down with a severe bladder and UTI infection from it , thankfully after a huge vet bill he is ok, lesson learned to never change litter.. I think the total says it all. I have 4 cata put out 4 additional boxes to their normal 4 for two days away, and there was barely any litter in any of the pans. These pans work really well in the top entry cat box we bought. It makes it easy to change for my husband and.kids who wanted the animals, but are often resistant to caring for them. A must have for kitty’s that travel! We absolute love these as our Calico Snickers is an amazing traveler! We just set up a in a box slightly bigger than the tray in the back of our SUV and when we go on long road trips to family and such she just goes in the back when she has to go! So convenient to bring them and use in hotels and family homes for holidays etc! These are great and affordable/travel option! RECEIVED - OPENED - GREAT Customer Service Though. These are not sealed very ell and kitty litter was everywhere. Would suggest they come with a sealed cover so top stays on correctly. The customer service at CHEWY is excellent - They are sending replacements. Thank you - I also suggested they contact the vendor who supplies product and helps prevent this from happening again. I bought 10 of these cat trays. They came in 2 boxes (5 Per Box) and 9 out of 10 trays were completely destroyed. I have bought these from other retailers online and never had this issue. They were so destroyed that I could not use them. These are perfect for when we travel. We have the auto clean litter box, but when we are gone, we put these out too. In case power goes out or any problems with the auto clean. ..